Day two at the 2012 Melges 32 Miami Championship awarded Alec Cutler on Hedgehog overnight honours after a fantastic day of racing. 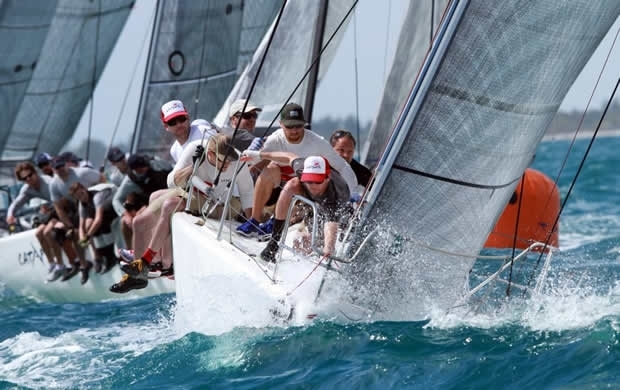 Ahead by one very slim point, Cutler leads the twenty-six strong Melges 32 fleet with 17 points. John Porter on Full Throttle is in second, only one point behind. Overnight leader Keisuke Suzuki aboard Swing dropped back to third, Jason Carroll's Argo is fourth and Alex Jackson's Leenabarca is fifth - one point separating each from the other. Teams were greeted with breezier conditions in the 15-18 knots range on day two along with more sunshine and temps in the upper 80s (F), making for more fun and a whole lot of speed, especially downwind. Alex Jackson's Leenabarca took command of the fleet in race one delivering an amazing performance leading from start to finish for the win. The real battle was for second place between Porter, John Kilroy's Samba Pa Ti and Vincenzo Onorato's Mascalzone Latino. Porter moved up to pass through the gate just ahead of Onorato, Kilroy followed. Porter stayed strong to finish second. Kilroy and Onorato finished third and fourth respectively, Carroll rounded out the top five. In race two, Cutler (the only owner that drives and trims his own main) finally found his groove launching off the starting line, then commanded the lead at the top mark, ahead of Roberto Tomasini Grinover on Robertissima in second and Mark Plaxton on INTAC in third. Teams blasted downwind to the tune of 15-18 knots of breeze. Cutler was fully lit extending his lead ever so slightly as the race progressed. Grinover suffered a set back no the first run when he jibed too hard, instantly shredding the spinnaker. Jackson and Lanfranco Cirillo's Fantastica and Phil Lotz's Arethusa mixed it up, jostling for position. Cutler's speed and boat handling could not be matched, awarding him the win, Cirillo came second and Jackson held in for third. For the final race of the day Cutler came on strong, however Porter managed to prevail. He started out rounding fourth behind Carroll, Cutler and Joel Ronning's Catapult at the top mark. At the gate he had moved up to third. By the final run to the finish, Porter aggressively took the lead at the final mark and rocked downwind for a big first place finish. Ronning completed the race with a satisfying second place, while Cutler settled for third. At the end of the day throw-outs went into play, placing Cutler atop of the leaderboard, Porter and Suzuki tied for points, second and third. Sunday marks the final day of racing. With a pretty intense cold front pushing through overnight into the late Sunday morning hours, the race committee will keep a close pulse on the progression of the weather. Forecasts are predicting potentially 20-30 knot breeze.